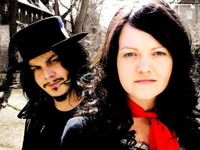 “We’re Going to Be Friends” is a promotional single by The White Stripes from their album White Blood Cells. It was released in late 2002, and tells the story of meeting a new friend at the beginning of a school year. The song is featured during the opening credits of the 2004 film Napoleon Dynamite. On The Commentary of the movie, writer/director Jared Hess states that originally, they couldn’t find a song for the opening credits, and they wanted to use this song, so they sent a copy of Napoleon Dynamite to The White Stripes and they approved to have this song used in the opening credits. Singer-songwriter Jack Johnson recorded a cover of the song on his album Sing-A-Longs and Lullabies for the Film Curious George. It currently runs as an advertisement for PBS Kids on PBS. This song was also played at the end of an episode of House entitled “Mirror Mirror,” which aired 30 October 2007. The song is not included in the show’s soundtrack.